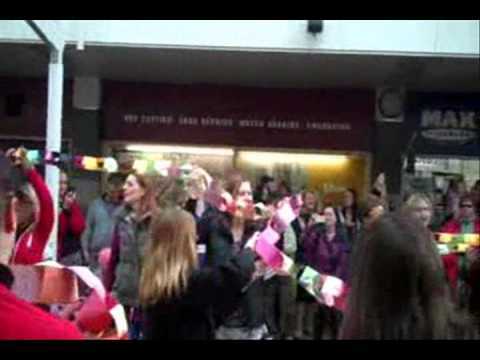 ​The event takes place at 12.30pm at Yate Shopping Centre and is part of a global campaign called ‘One Billion Rising’, which is a day of action happening around the world to help put a stop to violence against women and girls. The spontaneous dance will be performed by council workers, members of the charity Survive and anyone at the shopping centre who would like to join in. A music track entitled ‘Break the Chain’ has been specially written for the event. Yate Children’s Centre has a base in the shopping centre and offers outreach support to families on a one-to-one basis. The service was praised in a recent Ofsted inspection for the crisis support it offers to vulnerable women. It was also recognised for its partnership working with the specialist domestic abuse charity Survive and together they offer drop in advice and information sessions fortnightly in the local area. Emma Britt who organised the shopping centre event. said: “THANK YOU to everyone who took part and gave their support, either by dancing, taking footage, being an extra pair of hands and also turning up to watch! There were also many messages of support from people who wanted to take part but couldn’t, thank you.